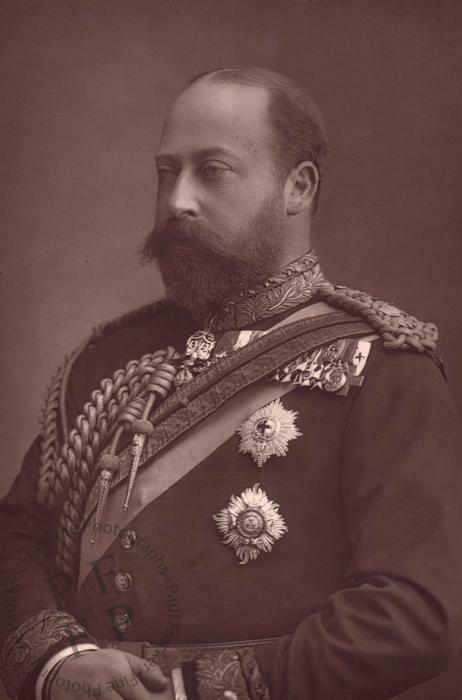 A Woodburytype portrait of Queen Victoria's eldest son, Prince Edward, the Prince of Wales, later King Edward VII. Condition: both the Woodburytype and the page on which it is mounted are in excellent condition. A printed caption in the lower margin identifies the sitter and gives ­the photographers’ details. Dimensions: the print measures 5.5” by 3.7” (14 cm by 9.3 cm) and is mounted with a buff-coloured border on an off-white page measuring 8.1” by 5.9” (20.6 cm by 15 cm).